6 + 6 = ? : (Required) Please type in the correct answer to the math question. The ferry across Long Island Sound was booked for 1:00PM. We got there early and got lucky to be the last vehicle loaded on the 12:00 noon ferry. This gave us an extra hour in Greenport. This is a beautiful old town on the eastern end of Long Island. We found a place to park downtown near TrawlerFest without too much trouble. Mavis stayed aboard and I spent a couple of hours talking to folks on the docks and in the boats on display, drumming up business for my talk. I set up our banner in the presenters' booth. Dinner with butterflyed shrimps still in the shells with mushrooms was at the Loft Restaurant. It was very good. About half way through dinner, an announcement was made that a severe thunderstorm was on the way. I left, got our banner from the booth, put it in the motorhome, and was back to the restaurant just as the rain started. The wind blew at 50 mph and the rain came down in buckets. The roof leaked over Bob Smiths seat, and all the people on the outside second floor deck had to abandon their seats and come inside. 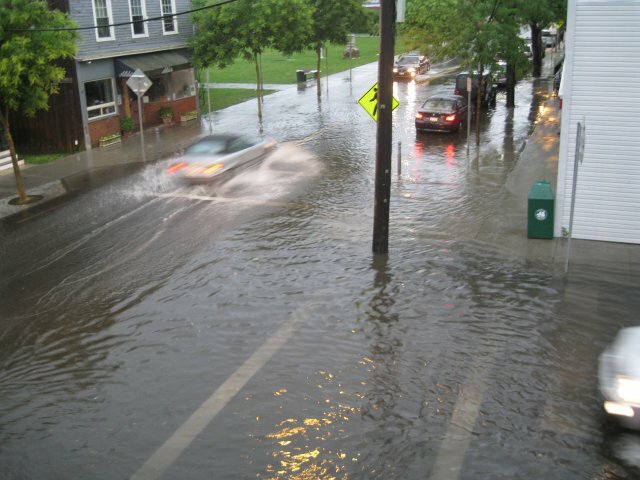 The rain was 6" deep in the roadway out front (see photo). When the rain stopped we returned to the campground and had a quiet night.